The ladder stand is actually a platform attached to the top of ladder. You get to sit on the platform and the whole stand is leaned against a tree (finding the right tree for the ladder is another topic. Just know that not any tree will do!) This type of stand is the largest option for hunting and is a great choice if you have kids (that is if you plan to take them when hunting). A ladder stand isn’t quite lightweight so setting it up is no easy job, not to speak about moving it around (which is why so important to find the perfect tree!). On the other hand, stealing a ladder stand isn’t easy either, so it’s a win both ways after all. Keep in mind to protect it with a canopy in case there is some raining announced (or not!). A great thing about the ladder stand is that it’s safe and, typically, easy to climb. You don’t even have to be fearless when it comes to heights in order to get on a ladder stand. The stability a ladder stand gives is also to consider. You just need the right tree, or better said, the right spot for the tree stand to setup. It shouldn’t come as a surprise to you if you can find a reliable ladder stand for a very good price. The Guide Gear 15′ Ladder Tree Stand sure surprised us in many ways, while presenting only few drawbacks… But who’s perfect anyway? 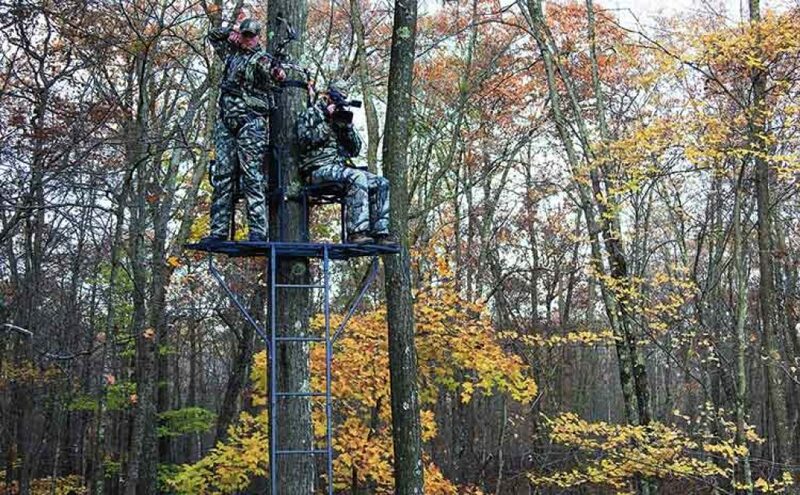 The ladder stand is a simple and low-priced option that manages to do what it’s supposed to: to keep you up in the tree, safe and sound, during your hunt. The setup of the ladder stand is easy to do on your own (you shouldn’t rely much on the instruction guide that comes with it) and fairly lightweight, considering it’s still a metal ladder stand. 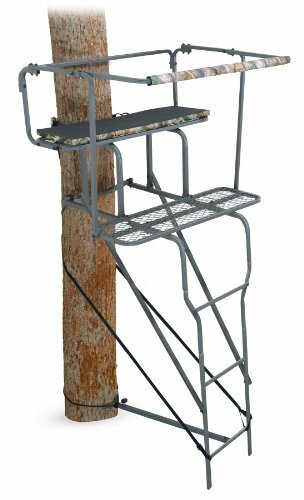 As a matter of fact, if you are new-entry level hunter, the ladder tree stand could be your no.1 choice. The ladder stand is for a single person and the pinner ladder sections make it easy for you to store it and carry around. There are some good features related to the ladder stand: the adjustable ladder support bar, the ratchet strap, the full-body safety harness and the two stabilizer straps. In addition, the safety DVD that comes along should give you full idea about the ladder stand (we didn’t say it actually does, though!). The seat has a good size (15’) and you can get a cushion for it for more comfort. The ladder stand has good stability and a rugged build that keeps you safe up in the tree. The minimal issues don’t over rate the overall quality of the ladder stand that, for a low price, manages to be sturdy, reliable and easy to put together. 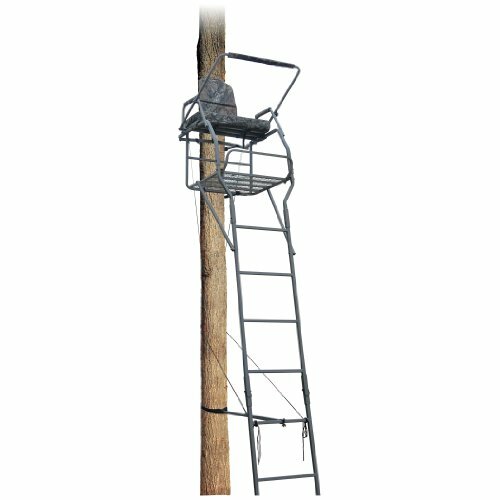 Comfortable and so generous when it comes to the seat area and floor surface as well, the Guide Gear 18′ Jumbo Ladder Tree Stand is one popular ladder stand you shouldn’t miss. The ladder stand is easy to set up (even though the instruction that come along aren’t the most helpful out there) and sure gives enough space for any big guy who’s on a deer hunt. The oversized foot platform with flip-up footrest means you get more space to do some stretching when on a hunt. The padded seat fits the picture, as it’s large, comfortable and keeps your back and bum protected from aches. Let’s not forget the seat lifts up, so this gives you extra space when you try to get rid of the numbness. The seat features padded armrests so it’s more comfortable for you to remain steady while you shot. The list of good things on the ladder stand continues with the rugged build. Along with the well-thought design, the ladder stand is also durable and provides good stability. Its steel construction takes the use for many years. The hardware and harness system are good quality also. 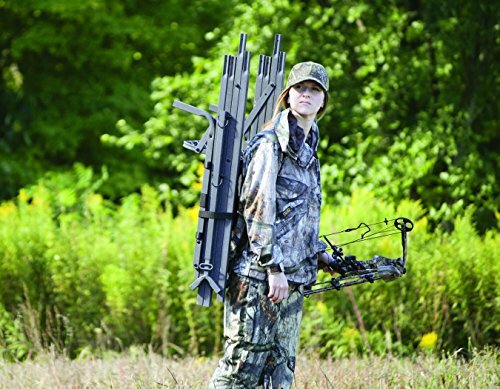 The tree stand comes with several functional features we need to mention: the flip-up shooting rail (ensuring stability when shooting), the flip-up footrest (even more comfort), two seat pad silencers (being quiet is major when hunting), two stabilizer straps, 1 ratchet strap and one support bar (easy to adjust) for more secure attachment. The full-body safety harness takes all your worries on safety away (well, it pretty much should, anyway!). Moreover, in case the list is not satisfying for you just yet, let’s not forget the three pinned ladder sections that solve the storage and transportation problem vanish. Despite the minor issues, we think the ladder stand is a comfortable, large, sturdy and safe option to have for your hunting. 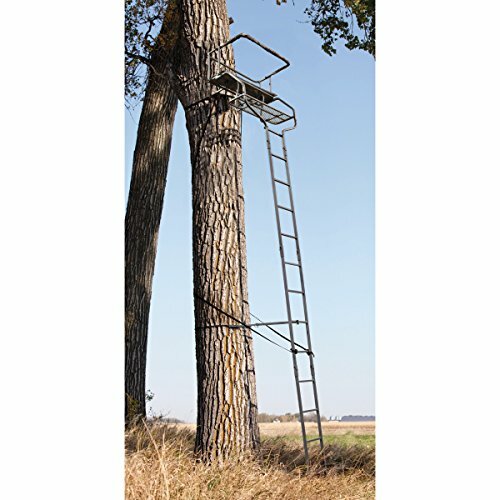 Extra-wide Rivers Edge 17′ Jumbo Jack Ladder Stand is a good option to consider for your hunting experiences and it’s not only the big width that recommends it. The ladder stand is very easy to setup and in the end you get a sturdy, safe and dependable latter stand. Going through the details, we also notice the very wide platform with footrest and the large shooting rail. The rail is easy to remove, so you can win more space when in need. The features on the ladder stand create a good product and the quick drying hydrophobic upper construction is just one of them. The upper body of the ladder stand is also abrasion resistant which is important to have. The reinforced toe improves protection, whereas the padded collar and tongue improve comfort and nice ankle support. We also notice the D-ring gravel guard attachment point and the mesh drainage ports on side panel, which are so functional. The list of efficient features continues with the lightweight shock absorbing EVA midsole and the felt sole that increases traction in some wading environments. The good-sized seat is comfortable and foldable, giving you more space. The ladder stand gives you plenty of space. The setup is no brainer, and it’s good to know the ladder stand also takes studs. All in all, the ladder stand is a great choice, reliable, safe and comfortable with plenty of functional features to consider. If you want the real thing when it comes to ladder stand, don’t sit on the fence and give it a try with the Big Dog BDL-1050 17.5′ Stadium Series. The ladder stand is part of the Steel Stadium Series XL and it’s a two-man ladder tree stand, which explains its size and build. Everything about the ladder stand says good quality and the dual-rail construction is one thing to begin with. 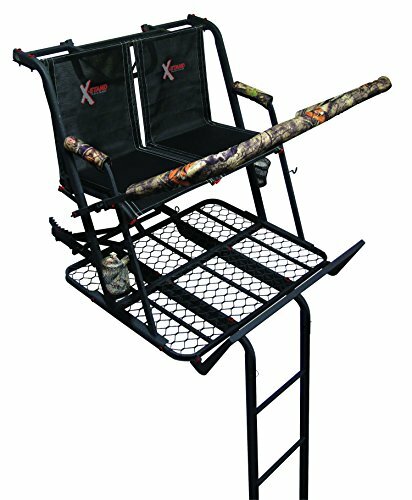 The ladder stand gives you a large foot platform and the well-padded seat combines great with the padded backrest cushion for greater comfort when hunting. The armrests are also well padded so the comfort should be complete when hunting. In addition, if this all of this isn’t enough, the ladder stand also features mesh curved foot platform, which is so nice and cozy to have when sitting for ours up in a tree. The ladder stand has a sturdy steel build and features double-tube ladder sections. The Camo blind wraps around the padded shooting rail so you get good hide just as well. The accessories on the ladder stand are plenty and functional: adjustable ladder support bar, stabilizing bar, capacity fall-arrest safety harness. The setup is easy and the ladder stand is safe. It’s not a bad idea to watch the TMA safety video that comes along for better setup. As it comes with pinned ladder sections, the ladder stand isn’t complicated to move around/store. We didn’t say easy, just not complicated. The ladder stand is sure tall and easily gives enough space for two people. It’s very stable and reliable. These minor issues aren’t deal breakers for us and we think the ladder stand is a great option, especially when hunting with your friend. 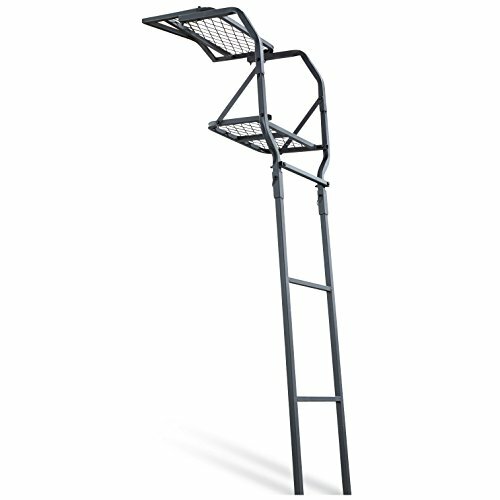 If you are looking for a ladder stand for you and your kid, the Ameristep 15-Feet Two Man Ladder Stand gives you plenty of reasons to buy it. The stand is big enough to fit two hunters and comfortable enough to even try some bow hunting. It presents plenty of features that ensure safe, comfortable and dependable use. The padded seat brings comfort for your back and bum, whereas the padded shooting rails minimizes arm strain. The ladder stand features Sinking Tamper Bar and comes with two harness for your safety. The stand is good quality and is completely powder coated, which makes it more durable. It comes with plastic washers on every bolt and nut, which increase its lifespan. The steps may seem a bit narrow, but the stand is very stable. The ladder stand is silent and it gives more room when the safety bar is down. The setup is easy and it doesn’t take you and your friend a lot of time to do it. All in all, the ladder stand makes for a rugged, reliable, safe and comfortable option for two (rather slim) hunters. Are you torn and can’t decide if you should go with a higher-priced ladder stand or simply settle with a low-priced one…do neither, and get yourself a middle-priced ladder stand. 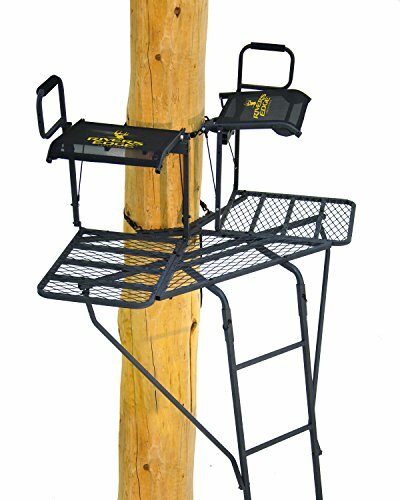 A good example that falls into the category is the Sniper Deluxe 2-man Ladder Tree Stand that brings to the table good quality, for not that much money. The ladder stand is sturdy, roomy and if you’re a big man, the stand is sure a great choice for you too. The stand is tall and comes with plenty of efficient features. The padded shooting rail flips so that you get the type of shot you want. The ladder stand comes with 2 safety harnesses, fasteners, adjustable support bar and cushion. It includes also two neoprene washers so the stand is very silent. The setup is rather easy, but it should involve a friend for fast and more efficient setting as it’s rather heavy weight. You get all the screws and nuts you need for the job also. 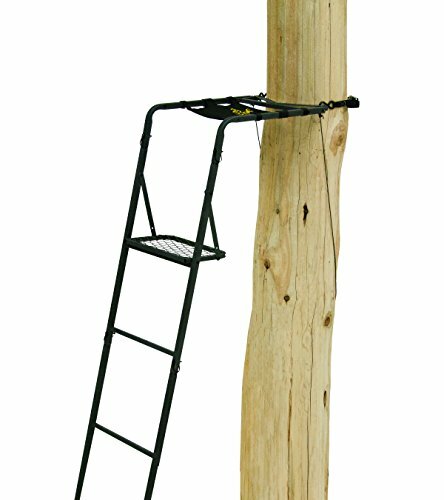 The ladder stand needs at least 9” diameter for the tree and gets you up to 18’. It’s rugged, solid, safe and comes for an attractive price. Nevertheless, for a fair price, you get a dependable, roomy, steady and comfortable ladder stand for two hunters. Hunting with a buddy is always nice and bow hunting with your fellow is even nicer. The Rivers Edge 2 Man Bowman Ladder Stand is especially design for bow hunting and is definitely an option to consider if you plan not to bow hunt alone. The ladder stand has a V-shaped design and keeps both of you tight against the tree, giving great concealment. The ladder stand is pretty tall (19’9”) and manages to keep you safe from winded incidents. When we take a closer look, we see several functions that improve your bow hunting experience. 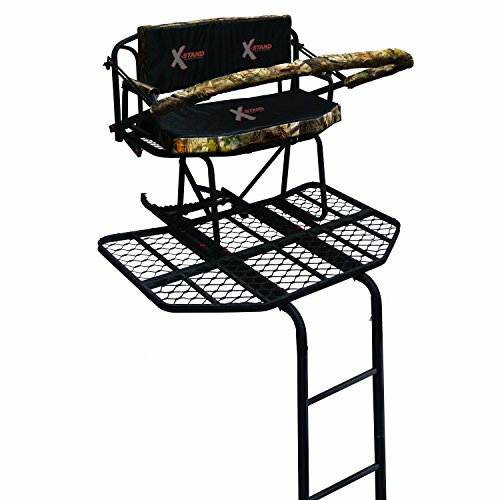 The ladder stand comes with TearTuff mesh seats that are not only long lasting and silent, but also very comfortable. In addition, they flip up for full platform use. The space the ladder stand provides is pretty big so both hunters comfortably sit/stand. You don’t trip on your friend and you don’t get on each other’s toes-literally speaking. The ladder comes with lots of pieces and you need to follow the instruction for the best results. The instruction is easy to follow and it’s better not to get all cocky about not reading them (trust us on this one). Once you set it up, the ladder stand is very secure, sturdy and reliable (and not quite easy to move either). It keeps you safe and comfortable as it also comes with two large harnesses and tree wraps. 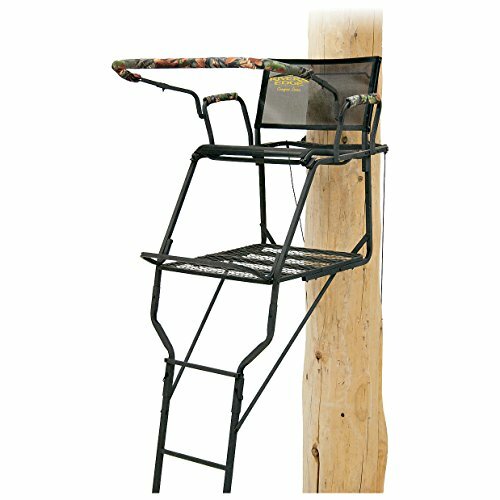 Despite the minor issues, for its great design, build and reliability, this ladder stand is a great asset on your hunting trips. Getting a ladder stand for you and your hunter friend is a big step and you should thinking it through as you don’t want to end up…on the ground. It’s not the case with the X-Stand The Jayhawk Ladder Stand that has a steel construction that keeps you and your buddy up in the air, safe and sound. The ladder stand comes with two 4-pt. full-body safety harness so you and your friend are safe up there. Without getting too much in the detailed numbers, the ladder stand presents 20’ height to shooting rail and a pretty large platform area (42” widex34” deep0. The seats are well sized and well cushioned for comfort throughout your hunting experience. The backrest increases the comfort also. The Comfort-Flex mesh seat flips up and out of your way when in need to use the entire platform. Now that we talk comfort, we also need to mention the padded armrest and the footrest that flips back. The stand is very quiet as it features Stealth Silencers- nylon washers that are very efficient to keeping things quiet (the washers are self-lubricating). There’s no reason for you to doubt the stability of the stand thanks to its X-Force expanded metal. The ladder becomes strong, sturdy and reliable. The Helix oval tubing simply adds up for more sturdiness and stability. The list of good things doesn’t end until we mention the powder coat on the stand with the Weather Defender, which means the stand, is protected against the elements. In addition, in case you are the picky type…the stand comes with two complimentary drink holders and two accessory hooks. Does this seal the deal for you? The cons don’t steal the thunder of the ladder stand, which makes it as a great option for any two hunters that really get along. If you like hunting but you find it complicated to find a sturdy, heavy-duty ladder stand for you, don’t hesitate and give it a try with the X-Stand Big Bubba Ladder Stand. The ladder is 16’ and is a great choice also for bow hunting. It comes with multiple features that make it safe, secure and reliable for your hunting experiences. The X-force grates, the adjustable shooting rails, the easy to grip Helix tubing are just few to being with. The list continues with the shooting rail and seat that flip up so that you may use the entire platform. Let’s not forget the Patent Pending Silent Snap Pin with special design for a complete noise elimination. The pin is kept locked tight so it eliminates the metal-on-metal clanking that you typically hear on other snap pins. The lockjaw safety system keeps you safe and secure the whole time. If we go through the specific numbers, we notice the deep foot platform (50”wide x30” deep) and the comfortable padded seat (wide 34”x15”deep). The seat cushions comes in DZX camo and flips out of your way for use of entire platform. The padded armrests increase the comfort and the stealth silencers keep things quiet. The silencers are self-lubricating nylon washers for no metal on metal contact. As for the stand’s strength, no worries either due to the x-force expanded metal. The ladder stand is strong, long lasting and…silent. The helix oval tubing sure increase its strength and stability. As for the weather…what rain now? The stand is powder coated so it’s protected against the elements, which also minimizes sound. The takeaway is that, if you are looking for a strong, reliable, steady and comfortable ladder stand, this one should obviously be in the cards. If you are the active type of hunter and like to move around a lot with your ladder stand, a great option for you is the Rivers Edge 16′ Pack-N-Stack Ladder Stand. The Pack-N-Stack stand is highly back packable and everything about it makes it that way. The stand is compact, lightweight and easy to carry around. The 38” ladder sections come together in a functional profile. It’s very easy to put the stand together and to take it down just as well. So many of us out there really hate when taking it down, but this isn’t the case for the ladder stand. The ladder stand comes with backpack straps, even though some find more comfortable their backpack straps. The ladder is also quite comfortable and the sling-style seat sure doesn’t add pain after a daylong hunt. If you are afraid of heights, even better for you to get the ladder stand. The stand gets you only 11’ away from the ground, which is not that much. The ladder stand is pretty safe (it may be seem wobbly during the setup but the effect disappears when you’re done with the setup) and secure. Lightweight, compact and so easy to put up together/take down, the ladder stand is a great option to consider. All in all, if you are determined to get a portable ladder stand, this one should stand to your attention.